Purely a gift to humanity and the earth alike, trees fill our lives with beauty, can be seen as a symbol of our own spirituality with deep roots and fortitude, and greatly aid in our health. One mature leaf provides as much oxygen as ten people inhale in a year. They also have the ability to filter chemicals and toxins, absorb pollutants such as carbon monoxide, sulfur dioxide, and nitrogen dioxide, and store carbon dioxide, which is a major global warming suspect. Is it any wonder we always want to hug them? It is said that each tree is blessed with a magical spirit who is born at the very time a seed is planted or dropped into place. 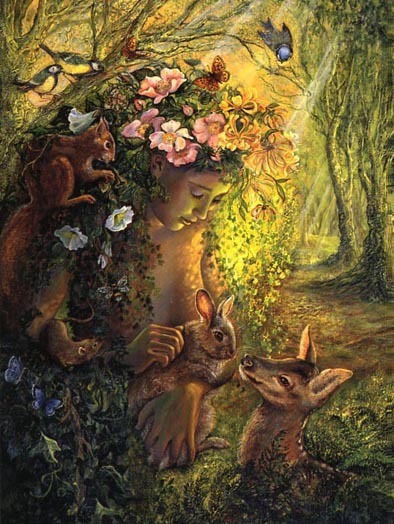 This nature spirit, always female, is called a Dryad. In appearance, she has the upper body of a woman, the lower body of a tree trunk, and is a sentience of the tree she inhabits. If the tree flourishes, so does its dryad, but if the tree is injured or killed, its dryad endures the same fate. Dryads are beautiful and carefree. They are said to be very shy and peaceful, preferring to frolic about in nature and live peacefully with their tree, as well as any creatures within their domain. They are woodland spirits of wisdom and healing, and can also bring messages from the Divine. The ancient Greeks believed that the Gods and Goddesses would punish anyone who did not first honor a tree’s dryad before partaking of its wood, so it was common and encouraged, that offerings be left at the base of a tree prior to cutting. Thankfully, this same practice is being used by many mindful pagans today.